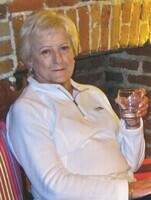 Provide comfort for the family of Alice Riech with a meaningful gesture of sympathy. Alice Riech passed away on March 28, 2019, at the age of 83. She was born on January 22, 1936, in Brooklyn, New York, to Charles Krukowski and Catherine (Sivik) Krukowski, the youngest of four. She graduated from New Utrecht High School and went to work as a secretary in New York City. In 1956, she became a flight attendant for United Airlines and began a life of travel and adventure. She married Alfred Riech in 1975, and together they continued to travel. They visited the far east, South America, and Europe many times. They even went to Africa three times, all while making the rounds of national parks and monuments of America. She worked as a dental assistant, secretary for the education center, secretary for Sysco Food Services, and then as a volunteer for the Oak Harbor Senior Center. In all of her jobs, she made lasting friendships. Alice is survived by her loving husband, Al; and by many nieces and nephews. A Memorial Service will be held at Wallin Funeral Home on Thursday, April 11th at 11am, following a private interment at Tahoma National Cemetery. In lieu of flowers, please make memorial donations in Alice’s name to the National Kidney Foundation (https://www.kidney.org/support). To send flowers in memory of Alice Riech, please visit our Heartfelt Sympathies Store. A private family interment will occur prior to the Memorial Service. Donations are being accepted for: NATIONAL KIDNEY FOUNDATION INC.
Jerry Brooks sent flowers to the family of Alice Riech. Jerry Brooks purchased flowers for the family of Alice Riech.